Stepparent adoption is a good option for many blended families. This is especially true when the other parent is not active with the kids. We see a lot of cases in which a child was born out of wedlock, and the mother (or father) is now married. Their new significant other is highly involved with the kids, but is not legally a parent. Adoption prevents the other parent from confusing the children. In these cases, we also see the other parent come in and out of the children’s lives. They’re gone for months at a time, and then swoop in… acting like they’re parent of the year. A common factor in these cases is confusion by the kids, and a lack of consistent contact by one of the biological parents. Another common thread is the other parent pays little to no child support. They only become involved when a child support action is started or there’s a request by the active parent to enforce or increase the child support. Adoption provides blended families with a chance to complete their family. 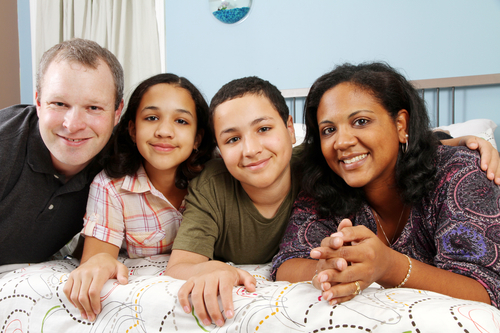 Fortunately, these families can seek a stepparent adoption. This is a one-step process in which the active parent files, along with his or her spouse, a petition to terminate the parental rights of the other parent. The petition also requests that the Court allow the new spouse to adopt the child or children. The standards to grant such a petition are tough, but many are granted. There must be evidence that the non-active parent has abandoned the children. This generally requires a showing that the other parent, while being able, makes little to no effort to support or communicate with the child. A finding of abandonment can also be based on emotional abuse or not supporting the mother during pregnancy. Adoptions have many procedural requirements. Kids who are twelve and older must sign written consent. Children of American Indian descent have further protections in place. And a putative father search has to be done with the Department of Vital Statistics. We have handled many stepparent adoptions over the years, and nothing has been more rewarding than putting together a family. If you know of someone who needs help with a Florida child adoption, please have them call us.